Yesterday I met Kerrie at Mom Vs. Marathon for a lunch run. My schedule has been CRAZY lately leaving lunch runs a distant memory. She ran to my office and I nearly missed our meeting time, got my OLD Garmin (Christmas this year time to upgrade) to catch a satellite and we were OFF. We talked a lot about the fact that neither of us have any races in the near future after my 8K this Saturday.. I cant wrap my head around 2012, the sole race I have on the plan is Rock N Roll Seattle Half because I MUST do this race every year.. Beyond that BLANK. -Will I help Muscle Man run his first Half Marathon? -Will I train for a Half PR myself? -Will I race Amanda Style and sign up at the last minute? I honestly don't know.. I am not sure what my major block is right now. 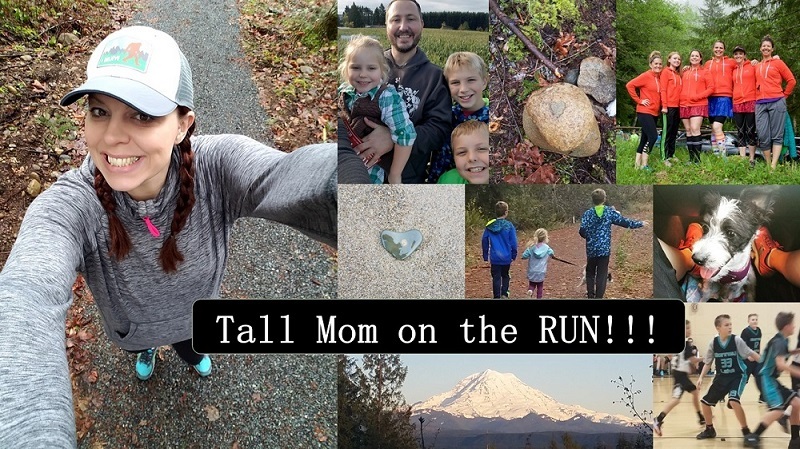 I am not overly stressed about it, but I feel like this Blog is in FLUX until I figure it out..
SOOOOOO... it is time for a MAKEOVER..
What would you like to see on Tallmomontherun.com? I am thinking of going for a White background with black text, easier to read. Sections for Race Reports, Coaching Tips, Product Reviews, etc. What would you like to see on Tall Mom Blog Makeover? Anyone Racing Run Wild this weekend at Northwest Trek?? If so let me know, I think I will be SOLO. I love the colors you use on your blog... so please even if you do go black/white...use the occasional bit of color. ;) Other than that I like everything you talk about. It's always fun to change things up! I am just realizing that with my lack of running I haven't updated my header image at all this year, it's still me running in the snow! As for your ideas on colors, like I commented on your FB post about this, I think the change would make for a cleaner, easier read. I am sure most people read posts in their reader at work like I do and the colored text you use is very hard to read in reader. They look great on your actual site with the dark background but when they on the stark white background of reader it's tough on the eyes. Admittedly I mostly read blogs on the reader and only go to blogs when I can sneak it... :) Good luck with the ch-ch-changes and enjoy that blank schedule!!! That just means you can run/race anytime, anywhere you decide to! I am all about spontaneous racing!! Your options are endless!! Change is always good, though I do love your blog the way it is. I love your blog the way it is, but my favorite things to read about on your blog are entries about running advice, and inspirational entries with quotes, and something to get me fired up about an upcoming race. I love planning the next years' races, so have fun filling your blank slate! I would love to read training tips. I've been a runner for about 18 months, but have yet to race. I'm not fast, and don't really aspire to be, but I would like to challenge myself and improve. I think having a blank slate for the new year is find. I always find blogs with less color and straight to the point are good on my eyes. I'm with the others here, while it can be good to have a plan well ahead of time, it's also great and freeing to wait and see what happens and plan as you go! I love reading about the random things you see on your runs, the funny things your little guys are doing, and all your running tips and bits of motivation. At the end of the year I will only have run 2 half marathons. I've never EVER run that few. I keep stalking race calendars but there's nothing that I'm jazzed about. funny- I just redid my page bc I wanted something different and another blog I followed she is revamping her's. Something must be in the air. I think white/blck is easier to read, but don't lose your unique format. I like your blog and content the way it is now. I agree with others that black and white text would definitely make it easier to read, especially when I use Google Reader to view your posts. Good luck in the 8k this weekend! I'm trying to figure out what my race schedule is going to look like for 2012, but I'm having a hard time for next fall. Lots of changes going on! Jesse will be doing the 5k, going for a big PR, and Peyton and I will be there cheering. Then P will do the kids run. I love this race, we will be cheering for ya! As my eyes age (faster than the rest of me, natch), it's harder to read on a dark background. The colors are fun, but it makes me feel swimmy against the gray/black. Good luck outlining that race schedule! It's overwhelming sometimes, but it will come together.